March was full of activity Chez 650Food, and things have been busy, busy around here — lest you think I was taking a hiatus and had run off to some tropical beach. (sigh. I wish.). Following home reno projects, spring cleaning, and a trip to our nation’s capital for the International Association of Culinary Professionals (IACP) annual conference, I’m looking forward to a bit of calm (read: quiet) in April. 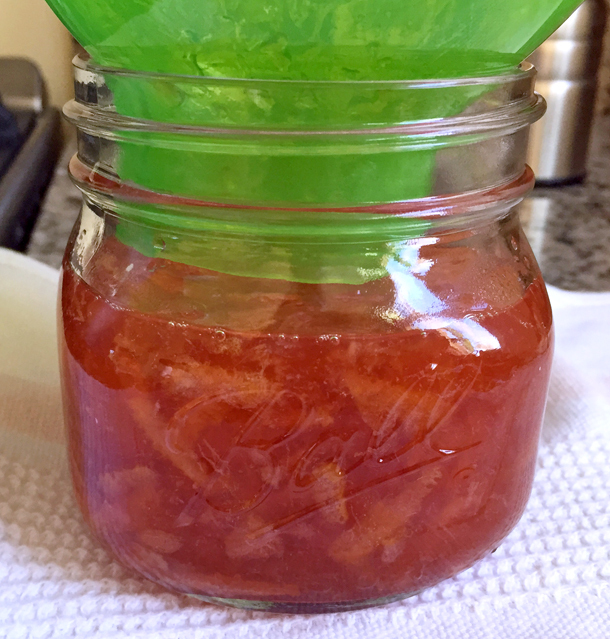 One project that I did manage to check off my list in March was a first attempt at canning (booyah!). Turns out that marmalade is a good solution for baby-stepping your way into canning, not to mention a delicious way to use up citrus fruits. In previous posts I’ve written about ways to enjoy a bounty of lemons (here, here, and here), but what about oranges? 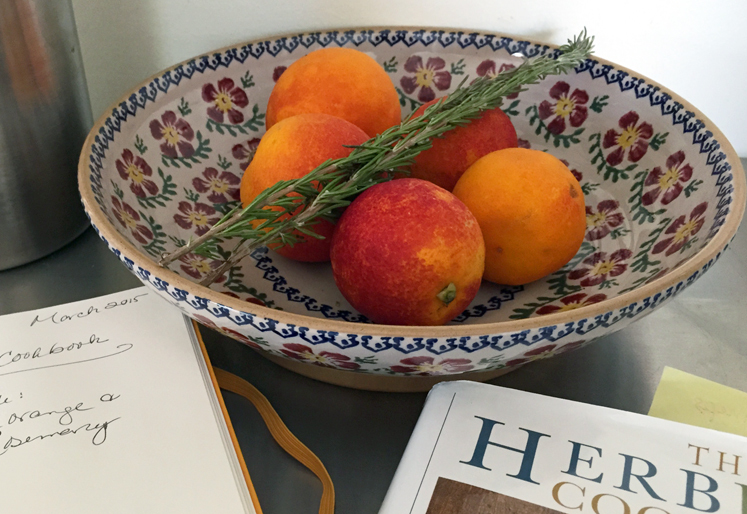 The last of the blood oranges are dwindling, but the navels and Valencias just keep a-comin’. When I was doing research for a Waste-Less Wednesday post on herbs, I came across a recipe for Orange-Rosemary Marmalade in Jerry Traunfeld’s The Herbfarm Cookbook. Let me tell you: the recipe is fool-proof. 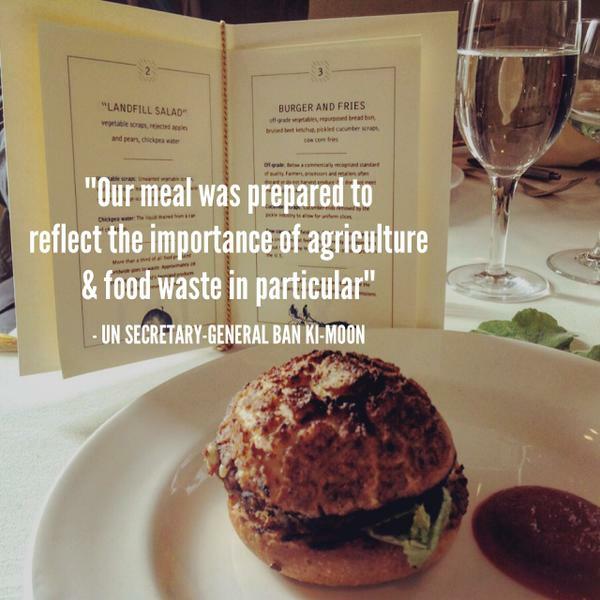 You don’t have to be a professional cook or experienced canner to get this one right. Nor do you have to spend hours over the stove. Best of all, the recipe can easily be halved for smaller households (because, really, who has space for 6 jars of marmalade??). 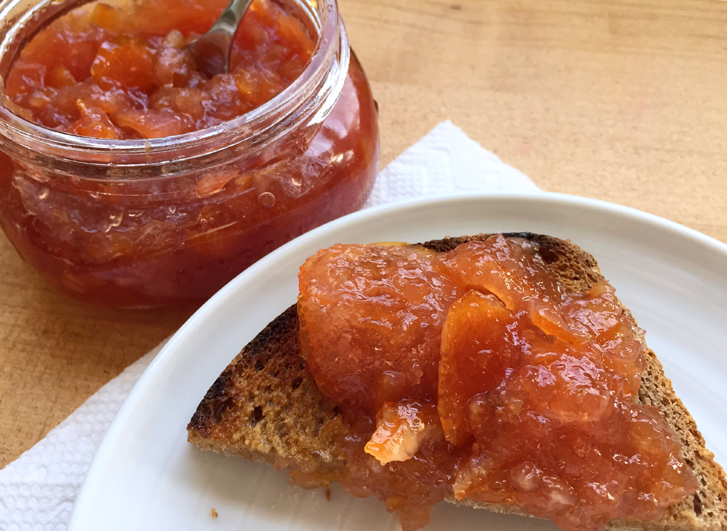 Why is marmalade such a good choice for first-time canners? 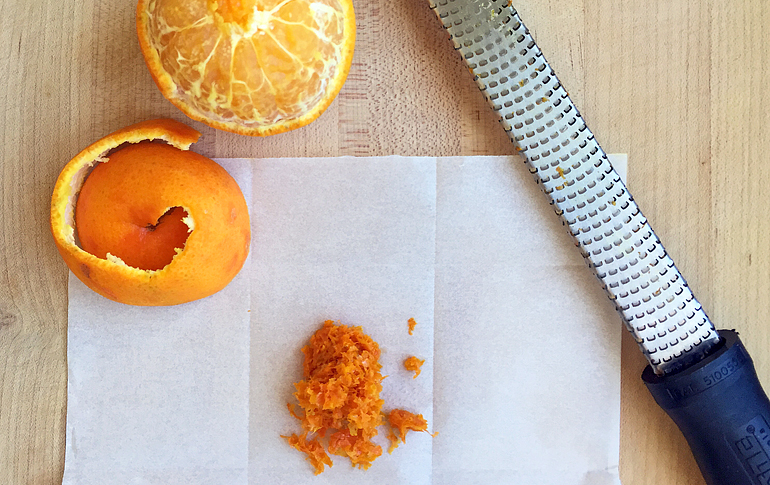 Fruit prep is simple: wash, dry, and slice. No special ingredients required: citrus fruits are high in pectin, a carbohydrate found in the cell walls of fruit, which acts as a gelling agent when combined with water. Citrus brings its own pectin to the party, which means that you don’t need to buy or add pectin. Not so time-consuming: Marmalade is fast! Total cooking time is 45-60 minutes, with the actual, hands-on part happening during the last 15 minutes or so. 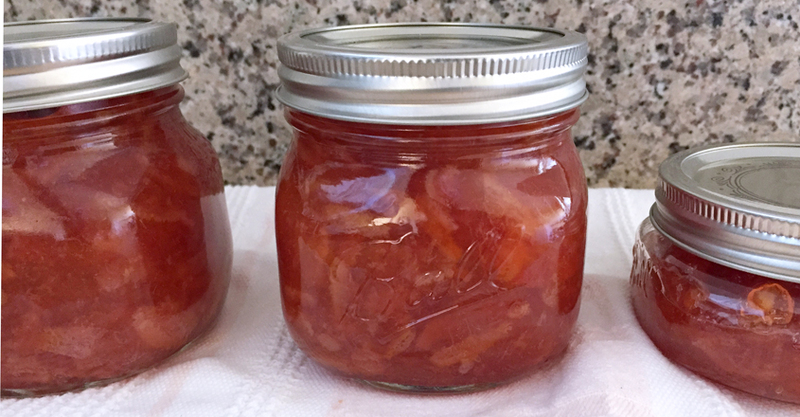 Food-borne botulism that results from home-preserved foods typically occurs in low-acid, high-moisture foods, such as tomatoes, green beans, and beets. Citrus-based marmalade is a high-acid food. The boiling process reduces the moisture content significantly. Sterilizing the jars by boiling them for at least 10 minutes is essential to reducing any possible contamination as well. For more information about food-borne botulism, check out this article on botulism from the CDC and this detailed post about canning from Food in Jars. So, thanks to the wonders of Google Books, you can check out the recipe yourself and make either a full or half batch as suits your needs. I made a half batch, which yielded 2 pint jars and a not-quite-full half-pint jar. 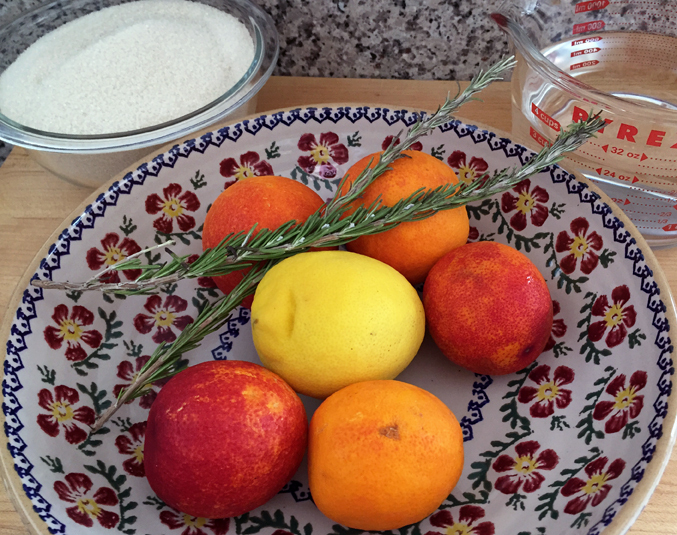 The ingredient list is short: oranges, lemon(s), sugar, water, rosemary. Choose organic fruit if you can, then you’ll only have to give it a quick rinse and scrub to remove any dirt. You can use any kind of orange, but the combo of blood oranges with rosemary elevates the marmalade’s flavor and gives it a pretty color. 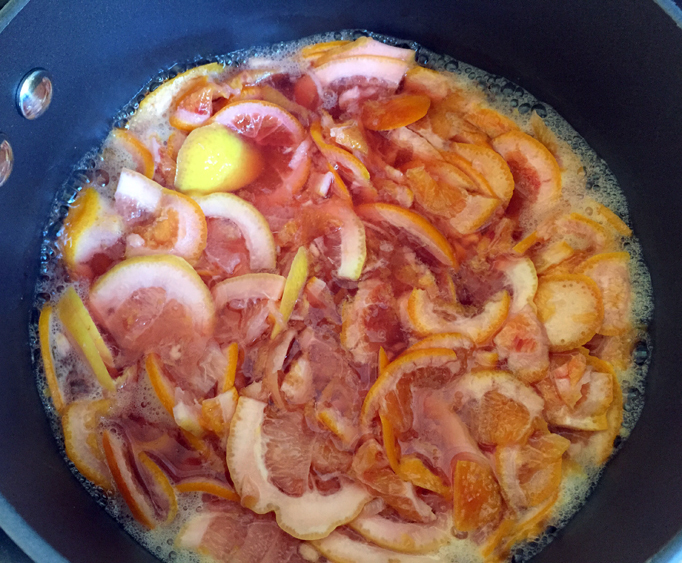 Plus, making marmalade now and preserving it for later means that you can enjoy blood oranges any time of year. 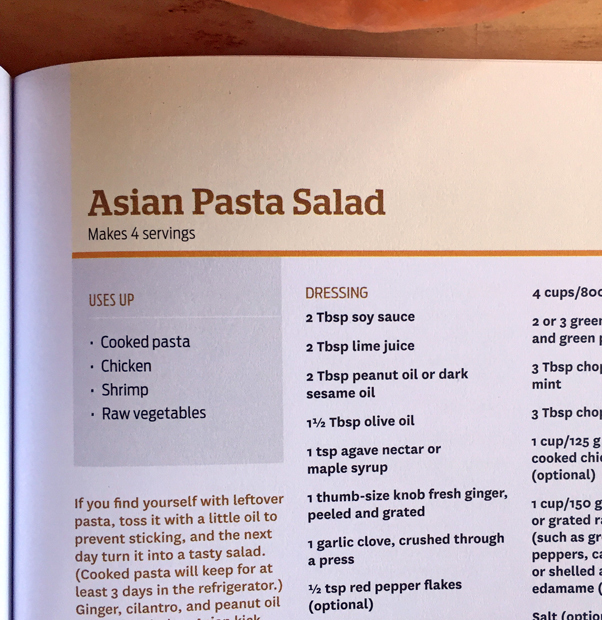 The recipe is a two-parter, so you’ll need to plan ahead a bit. 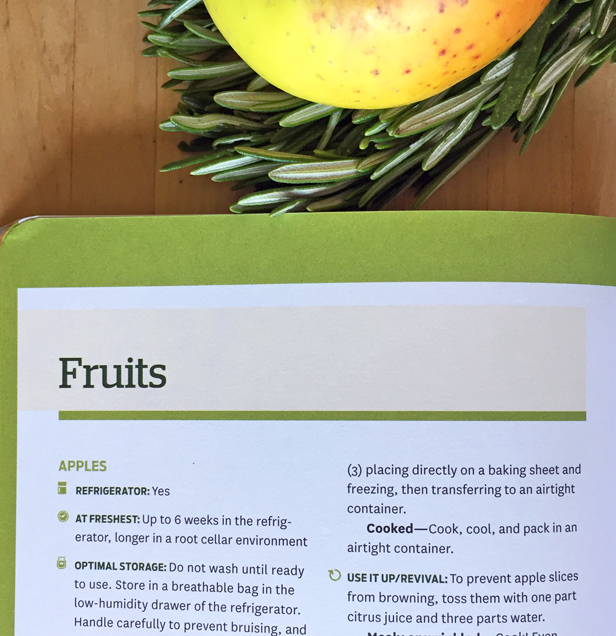 On the first day, prep the fruit: wash, dry, slice in half and remove seeds, then slice the halves thinly. 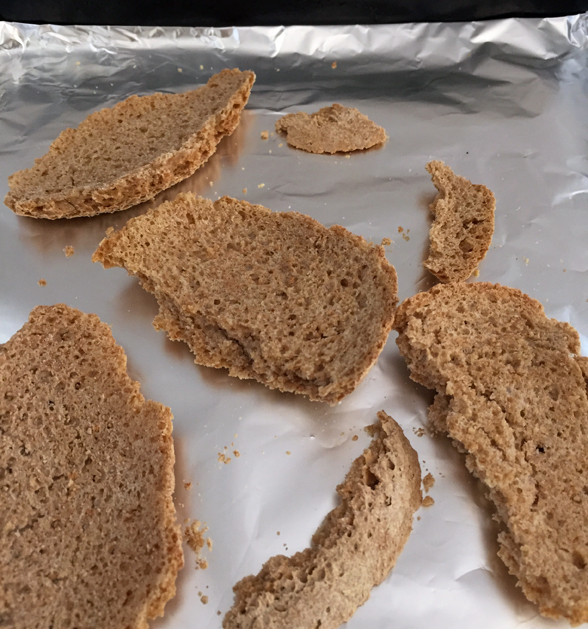 If you have a food processor with a slicing disk, you can get the work done in just a few minutes. 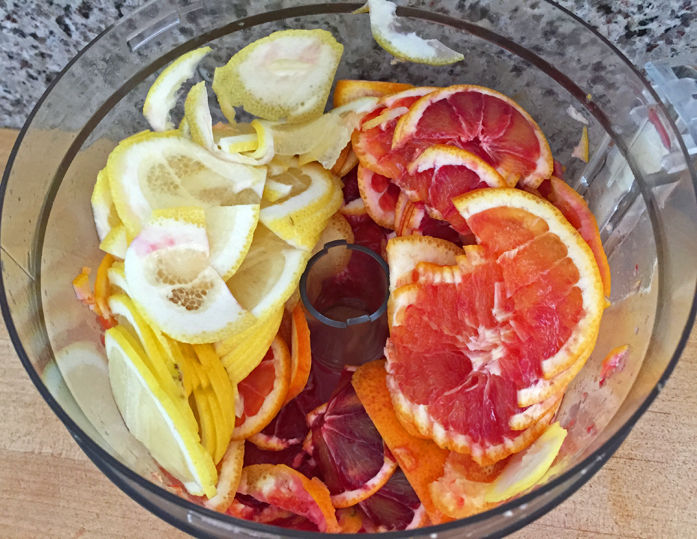 Sliced fruit goes into the pot with water for an overnight soak that softens the rinds and releases the pectin. 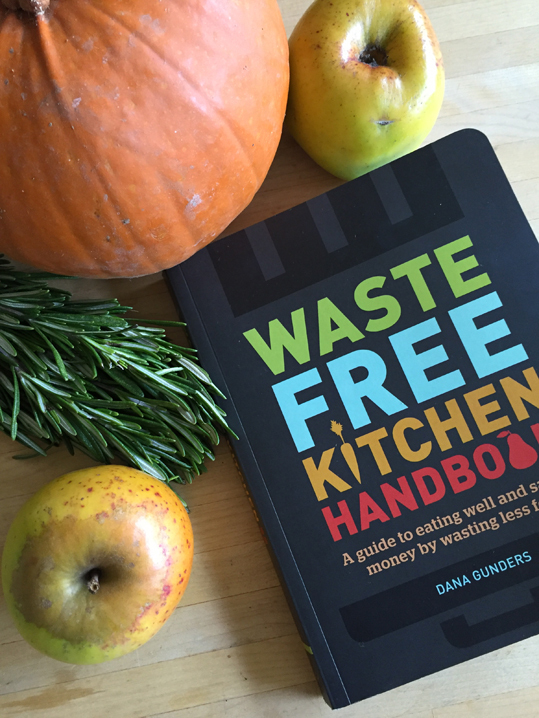 On the second day, you boil the water and fruit for 30 minutes. The fruit will soften further as it cooks down and the pectin is released. 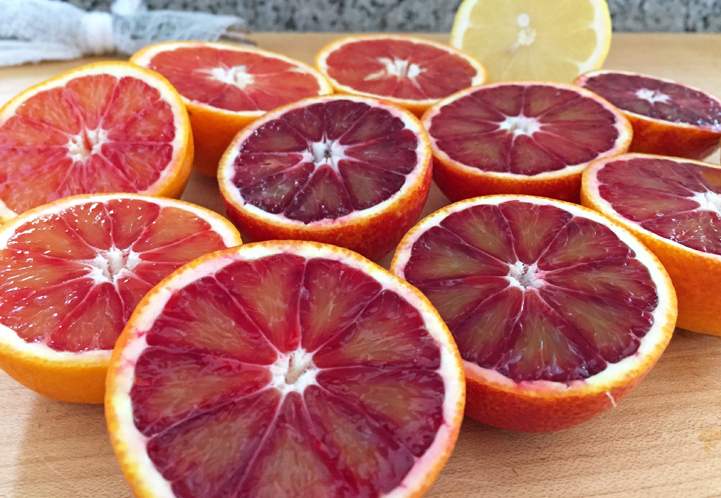 The color will start to change from a rich blood orange to a pinkish-orange color. After boiling the fruit for 30 minutes, add the sugar and rosemary sprigs (wrapped in cheesecloth and tied) and continue boiling for 15-30 minutes. This is the part where you want to be nearby and pay attention. You’ll also want to sterilize the pint jars by submerging them in boiling water for at least 10 minutes and sterilize the canning lids and bands in a separate saucepan. As the marmalade mixture starts to gel, the bubbles will change from small, quick champagne-like bubbles to larger, thicker, more viscous bubbles. 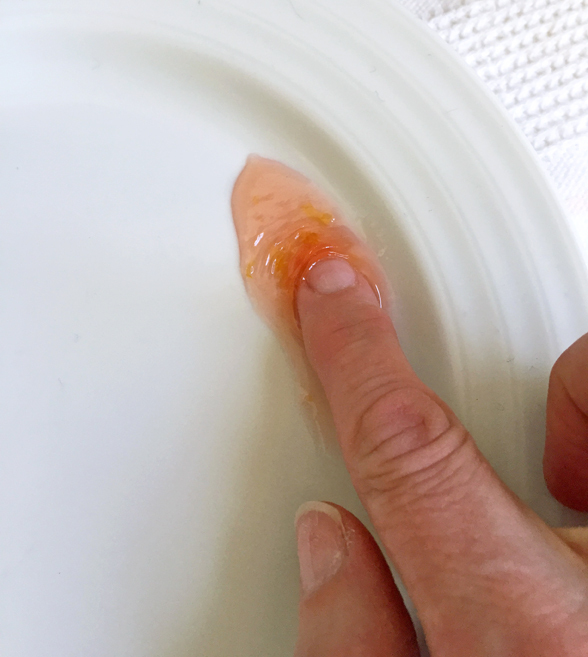 Once you see those larger bubbles (around 15-20 minutes in), do a “wrinkle test” to see if the marmalade has set up or needs to continue cooking. You don’t need any special equipment for making this marmalade, other than some pint-sized canning jars with lids and lid bands. In the 650 you can find pint-sized jars sold in packages of 4 or 12 at Orchard Supply, Ace Hardware, Target, and Whole Foods. The Ball Jar folks also make an inexpensive canning-tool “kit” that includes a jar lifter, headspace tool (for measuring how much space to leave below the mouth of the jar), wide-mouth funnel, and a magnetic lid lifter. The kit, which is available at Orchard Supply and Ace Hardware, is a “nice-to-have,” but not required. You can substitute items that you likely already have at home. Got a pair of kitchen tongs? Create a gripping jar lifter and lid lifter by wrapping a thick rubber band around each wide, scalloped end of the tongs. Keep a metal ruler handy for measuring headspace. The real test of canning success is waiting to find out how well you sealed the jars. You won’t know until the jars have cooled almost completely whether or not you have a good seal. If you press on the center of the lid, and it doesn’t pop back at you, congratulations! You’ve got a good seal. Refrigerate jars that don’t have a good seal — or any about which you might be concerned. Also, refrigerate any jars that weren’t filled to the headspace recommended in the recipe. You’ll want to open and use those first. I’ll admit to doing the happy dance in my kitchen when those lids didn’t pop back at me. Maybe it wasn’t a Tom Hanks “I have made fire!” (Castaway) moment, but it was pretty cool. Have you made marmalade? Share your experience or ideas in the comments. 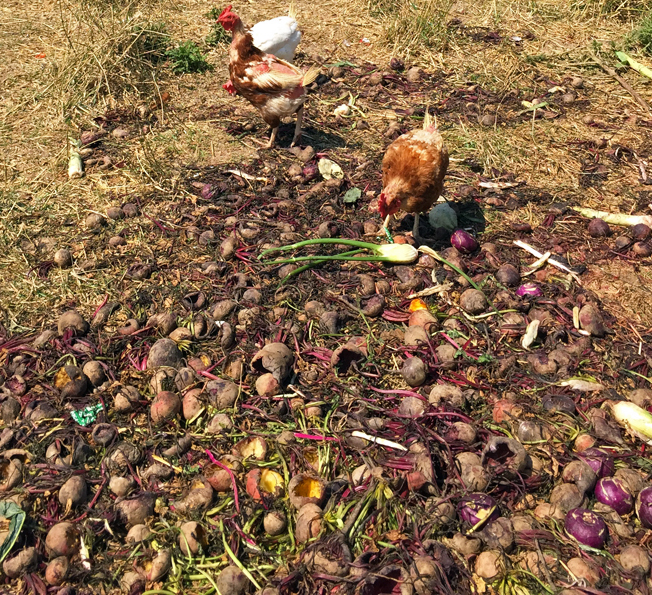 I have a “minimizing food waste” question. I bought loads of fresh herbs for holiday cooking. 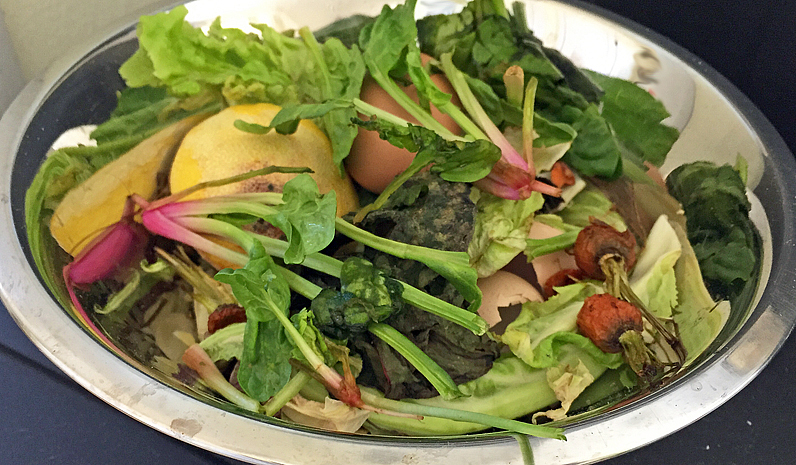 Some I have in a cup of water in the fridge, but others are in their mini plastic clamshell awaiting turning into mush before being dumped unceremoniously into the compost bin. What’s the best way to preserve these herbs? Thanks! So much parsley! What to do…? Great question (thank you Amy)! Sound familiar? How often do you buy a bunch of herbs, but only need, oh, a tablespoon or a few sprigs for a specific recipe and are then left wondering what to do with the rest? Herbs are mostly delicate little things and have a short lifespan, even if you store them properly. Herb cubes. 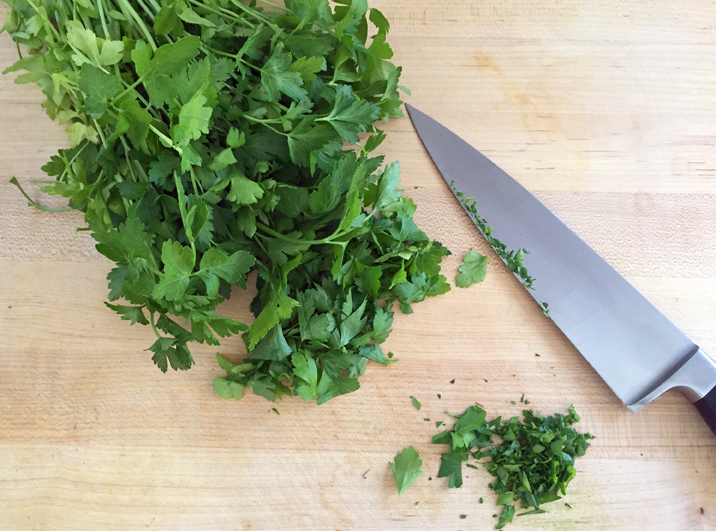 Chop herbs finely, place into ice cube trays, and gently top off each ice cube mold with water before freezing. 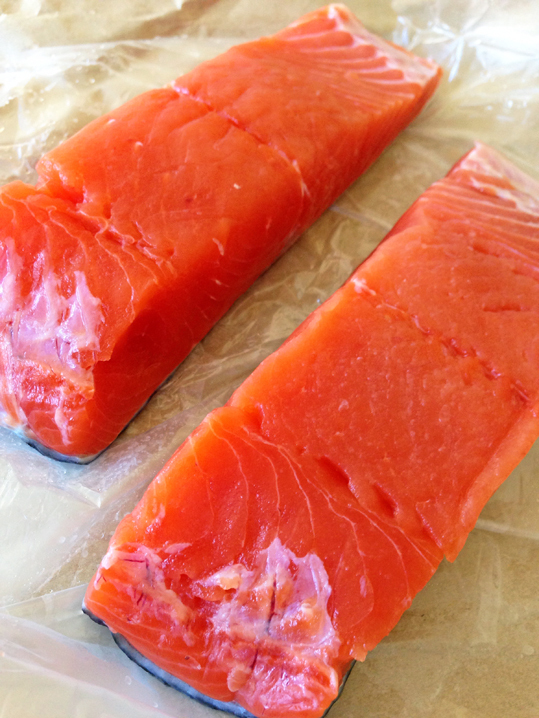 After ice cubes have hardened, you can remove them from the tray and store them in freezer bags. Need a visual? 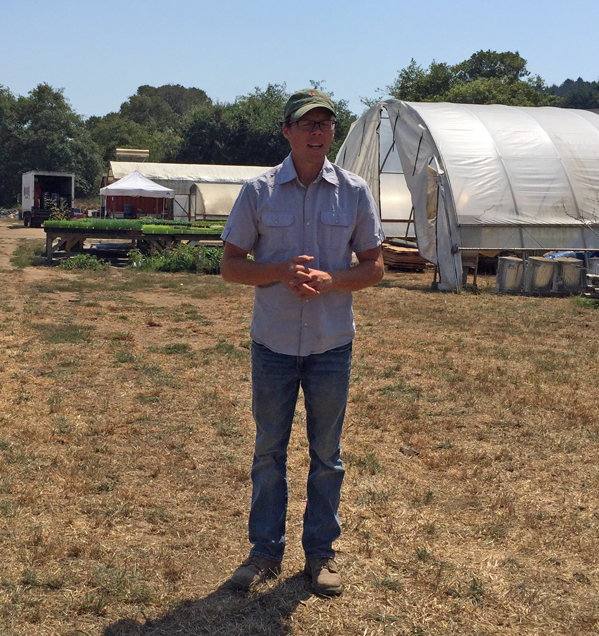 Check out Organic Gardening’s slide show. Keep herbs whole and store in freezer bags. If you want to skip the chopping and just get to preserving, package your whole herbs into freezer bags. Make sure to press as much air as possible from the bags before sealing. Better Homes & Gardens recommends freezing for these more commonly used herbs: basil, chives, dill, lemongrass, mint, oregano, sage, tarragon, thyme. While I’ll always take fresh herbs over dried, having a stash of dried herbs on standby is a great option when you don’t have access to fresh or frozen herbs. There are a variety of methods for drying herbs, including air drying, low oven (180° F for 2-4 hours), dehydrator, and microwave. I’m old school and go for the air-drying method (least amount of work, too! ): I tie a bunch together with a pretty ribbon, then hang them upside from a hook in my kitchen. After the herbs are dried, I remove the leaves/buds from the stems and store them in a glass jar or plastic container. So that covers preserving, but what about ways to use up fresh herbs before they start to turn brown or drying becomes your only option? 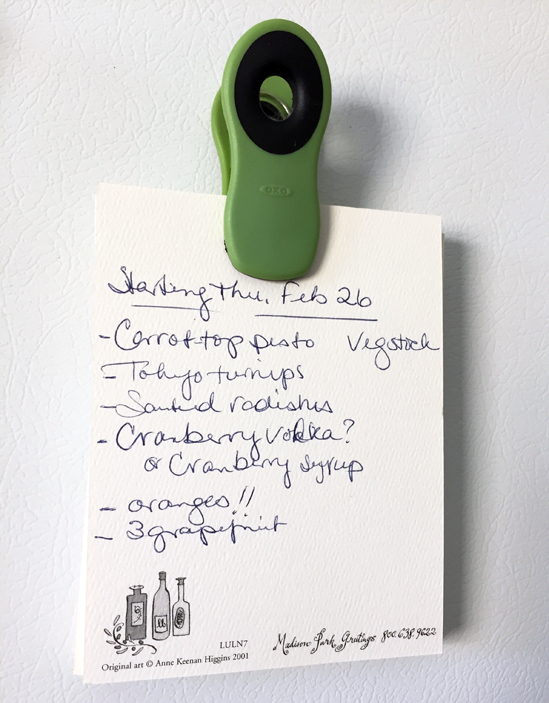 Honestly, once herbs go into my refrigerator, I forget about them. When I had herbs growing in my garden last summer, it became an evening routine to grab a pair of scissors, head out to the yard, and just snip as much as I needed for the evening meal. But somehow when I buy herbs from the market, I don’t feel as inspired to use them on a daily basis and factoring them into daily cooking takes a bit of effort. 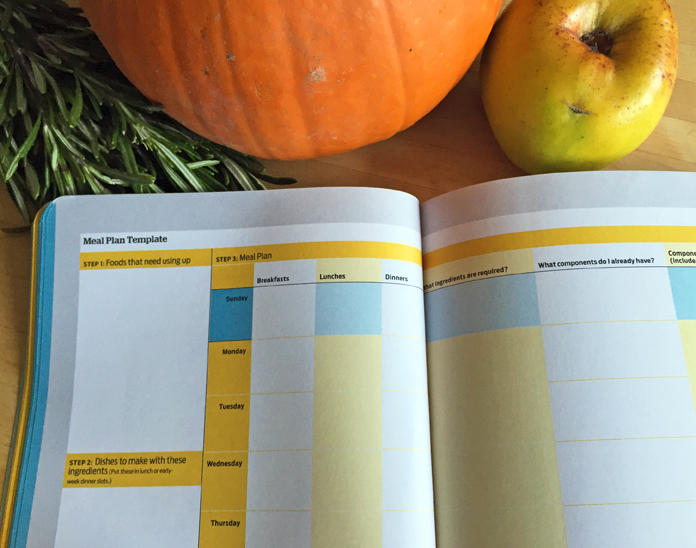 Here are some of the ways in which I’ve been using — and using up — herbs. Herb-infused simple syrups can be used for flavoring cocktails, making non-alcoholic spritzers, dressing up a fruit salad, sweetening lemonade… just to give you a few ideas. Best herbs for simple syrup infusions include lavender, rosemary, and sage. 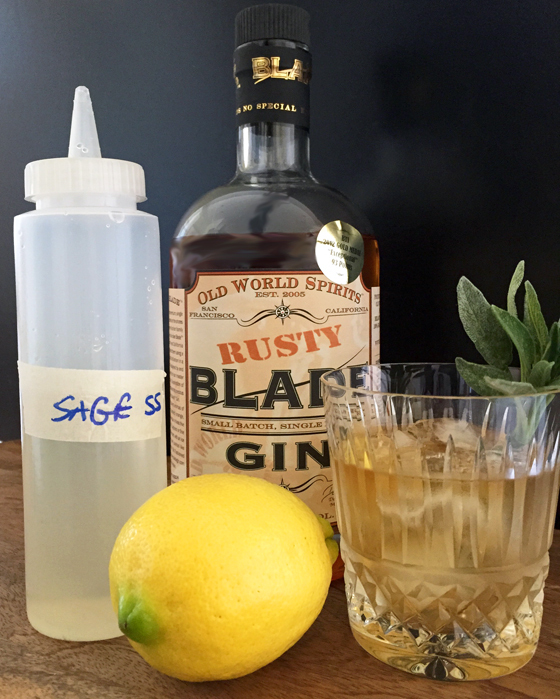 Sage simple syrup pairs well with whiskey and gin cocktails. Try it with Belmont’s own Rusty Blade gin. 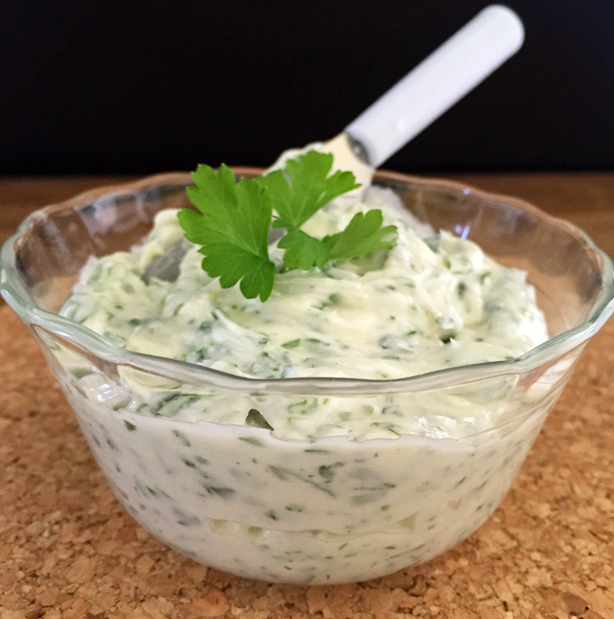 Herb butter is so easy to make it’s ridiculous! 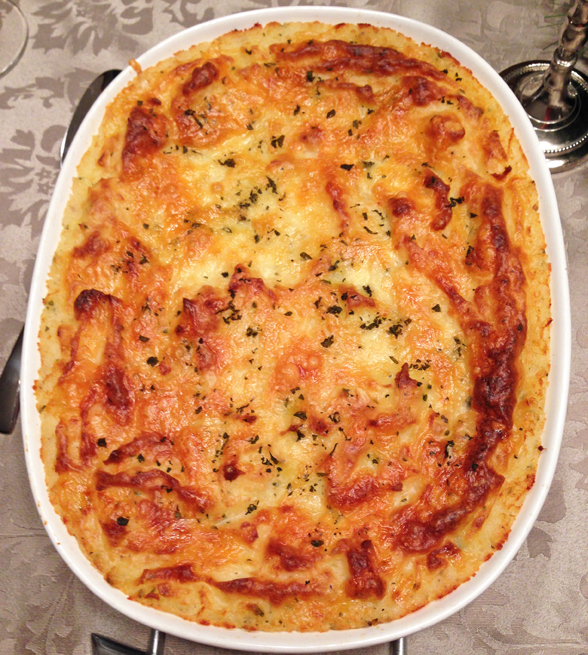 And it’s sooo good on bread, crackers, fish, potatoes… pretty much anything that can serve as a butter-delivery device. Want to make it right now? Put 1 stick of butter into a microwave-safe bowl (remove the wrapper first), heat in the micowave until soft, then mix with a spatula until smooth. 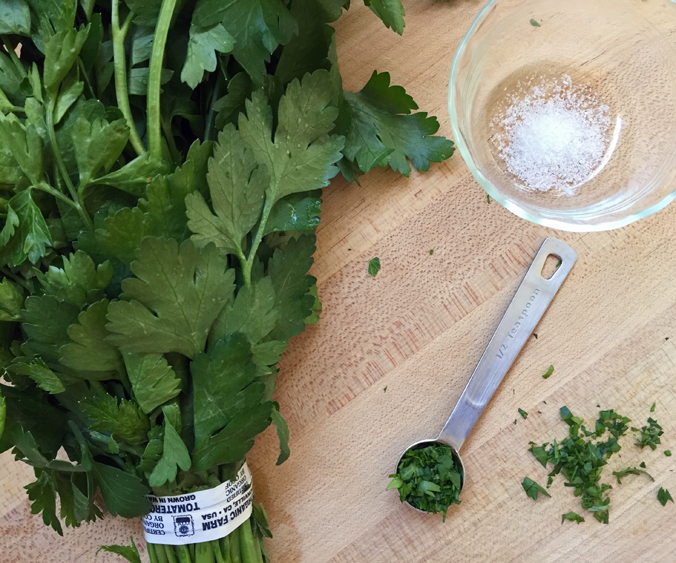 Add 2 tablespoons of finely chopped herbs (try parsley, chives, oregano, or thyme) and ¼ teaspoon of salt. Mix again until smooth. Level up? Add two roasted garlic cloves (smoosh and mix into the butter). 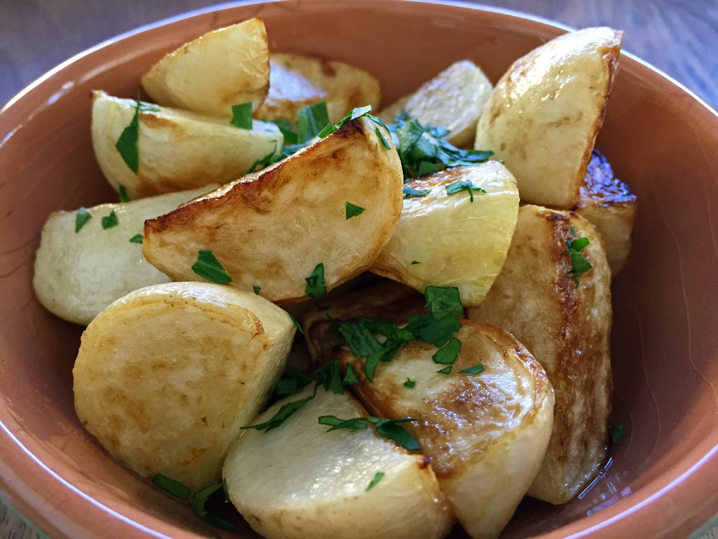 Herbs and vegetables are a natural combo: parsley and potatoes; oregano, tomatoes, and eggplant; thyme and radicchio just to name a few. My new fav? 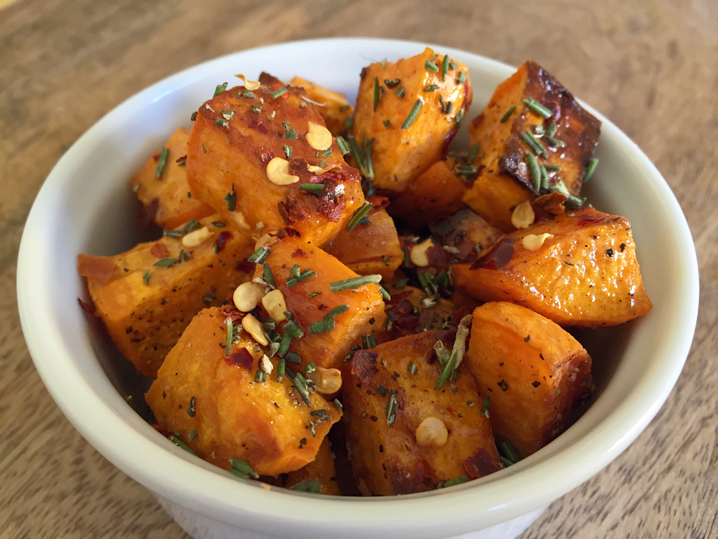 Roasted sweet potatoes, finished with a drizzle of local orange blossom honey, crushed red pepper, and finely chopped rosemary. 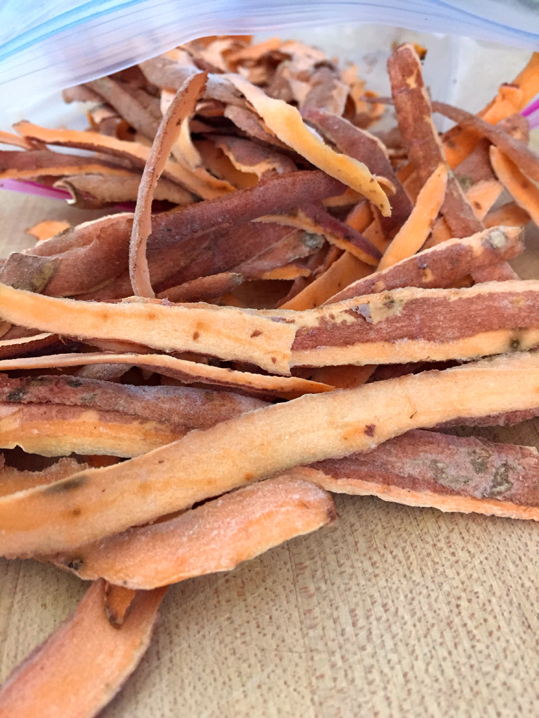 Spicy, salty, herbal, sweet: roasted sweet potatoes with a drizzle of local honey, crushed red pepper, ground sea salt, and fresh rosemary. When I’m absolutely too tired to cook and too hungry to wait for delivery, I’ll make soba noodles and top them with whatever I can assemble in the four minutes it takes the noodles to cook. If there are no leftover roasted vegetables ready to go, then finely chopped herbs, olive oil, a sprinkling of sea salt, and a handful of shredded Asiago cheese will do the trick. 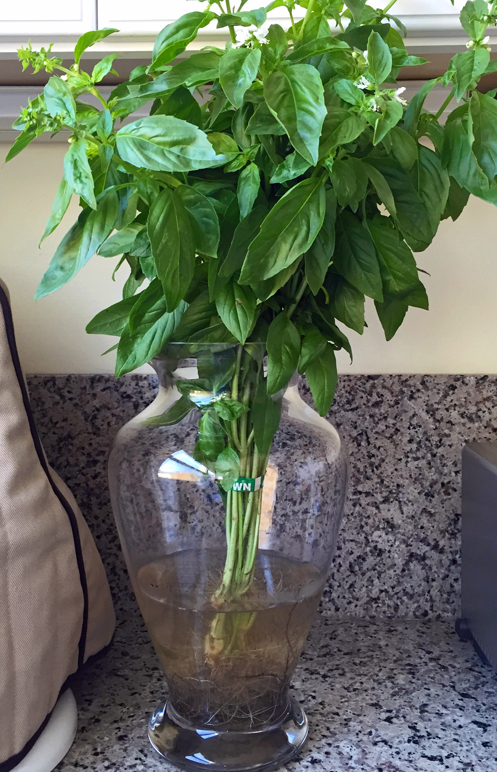 How do you preserve or use up fresh herbs? Share your ideas in the comments below! 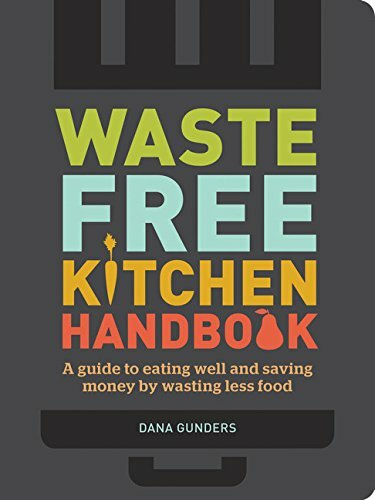 You are currently browsing the Food Waste category at 650Food.